Seal-Once™ Poly Blend Waterproofing Wood Sealer provides a revolutionary all-in-one product for all exterior and interior wood surfaces with long lasting protection, vibrant tints and eco-friendly waterproofing. 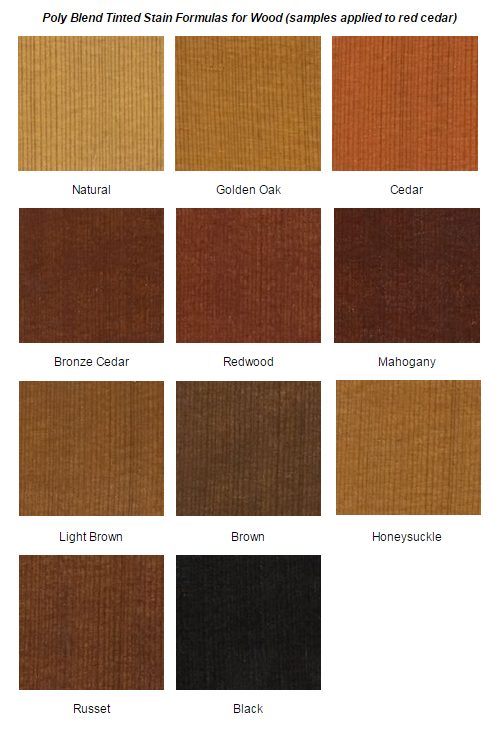 Vibrant tint selection creates a striking look on your home or deck. Increased resistance to abrasions means your deck looks beautiful longer. Guaranteed to keep water out for 6 years on horizontal surfaces and 10 years on vertical surfaces, means less labor and more time enjoying your home. Seal-Once™ Poly Blend Waterproofing Wood Sealer uses a blend of waterproofing polymers and polyurethane designed to penetrate deep into wood and move with a wood’s natural expansion/contraction cycles. Actual coverage will vary due to porosity of the wood on which it is applied. In cases where Seal-Once™ Poly Blend Waterproofing Wood Sealer Waterproofing Wood Sealer is applied to very dry, weathered or media blasted wood 3 coats may be necessary. Seal-Once™ Poly Blend Waterproofing Wood Sealer Waterproofing Wood Sealer is a two coat product. Applying less than two coats will greatly affect the durability of the product. All surfaces must be cleaned before applying Seal-Once™ Poly Blend Waterproofing Wood Sealer for best saturation and performance. We do not recommend sanding due to the pores of the wood may fill with sawdust impeding the penetration of Seal-Once™ Poly Blend Waterproofing Wood Sealer. Mix All Wood Cleaner according to manufacturer’s directions on the container. Apply All Wood Cleaner from bottom to top with a pump up sprayer. Rinse with a pressure washer at no more than 500 psi. Washing with a pressure washer above 500 psi can damage wood. Allow wood to dry for 3-5 dry, warm days before applying wood finish. Most finishes require wood to below a specific moisture content. Make sure to check the wood with a moisture meter before applying wood finish. Mix X-180 Weathered Wood Restorer or All Wood Cleaner according to manufacturer’s directions on the container. Apply X-180 Weathered Wood Restorer or All Wood Cleaner from bottom to top with a pump up sprayer. Allow wood to dry for 3-5 dry, warm days before applying wood finish. Most finishes require wood to below a specific moisture content. Make sure to check the wood with a moisture meter before applying wood finish. Note, walls beneath a porch roof / overhang will not dry as fast as exposed walls. Please note: This cleaning solution will remove mold and mildew and will not remove the tint. Do not apply Seal-Once™ Poly Blend Waterproofing Wood Sealer Waterproofing Wood Sealer to wood with over 22% moisture content. Laminated logs: The moisture content of laminated logs is generally below 14%. These logs are usually ready for immediate application of Seal-Once™ Poly Blend Waterproofing Wood Sealer Waterproofing Wood Sealer once they have been cleaned and allowed to dry for the appropriate amount of time. Always use a moisture meter to confirm the moisture content. Green, wet, or treated logs: These logs have a moisture content greater than 22%. Allow the logs to sit in a dry area and check their moisture content on a regular basis. Logs with high moisture content can take up to 6 months to 1 year to reach the appropriate 22% or below moisture content for applying Seal-Once™ Poly Blend Waterproofing Wood Sealer. Why apply a wood preservative (borate) before applying Seal-Once™ Poly Blend Waterproofing Wood Sealer? Applying a wood preservative can protect your home from damaging organisms for the life of the home. Seal-Once™ Poly Blend Waterproofing Wood Sealer soaks into wood to create a film that protects against mold/mildew growth and repels water. If a tint is chosen with Seal-Once™ Poly Blend Waterproofing Wood Sealer, the tint provides UV protection. Seal-Once™ Poly Blend Waterproofing Wood Sealer on its own is not a wood preservative. LogFinish.com recommends applying ShellGuard RTU or ShellGuard Concentrate to your logs before applying Seal-Once™ Poly Blend Waterproofing Wood Sealer. Fill any spaces between the logs and upward facing cracks/checks in the wood after applying a wood preservative and before applying Seal-Once™ Poly Blend Waterproofing Wood Sealer. Fill all joints, cracks, and nail holes with a good quality acrylic latex caulk/filler created specifically for use with wood like Energy Seal or Check Mate 2 prior to applying finish. We always recommended performing a two coat color test to a clean, dry, bare area of the structure that you are planning on applying Seal-Once™ Poly Blend Waterproofing Wood Sealer. Please Note: Seal-Once™ Poly Blend Waterproofing Wood Sealer is difficult to remove once it has been applied. Before doing a full application make sure that your color selection is correct, has a look you want, and a maintenance schedule you can manage. If applying in direct sunlight and wood is hot, spray with a mist of water and apply Seal-Once™ Poly Blend Waterproofing Wood Sealer immediately on dampened surface. New pressure treated wood should be allowed to dry 3-6 months before applying Seal-Once™ Poly Blend Waterproofing Wood Sealer. Clear Seal-Once™ Poly Blend Waterproofing Wood Sealer will not provide UV Protection, only an added Seal-Once™ Tint will protect wood from sun damage. Without tint added, wood will gray naturally within 2 years of application. Seal-Once™ Poly Blend Waterproofing Wood Sealer is a two-coat application on clean, dry, bare wood with moisture content below 22%. Any less than two coats will lead to greatly decreased durability. Wood already coated with Seal-Once™ Poly Blend Waterproofing Wood Sealer, requires one maintenance coat depending on weathering. 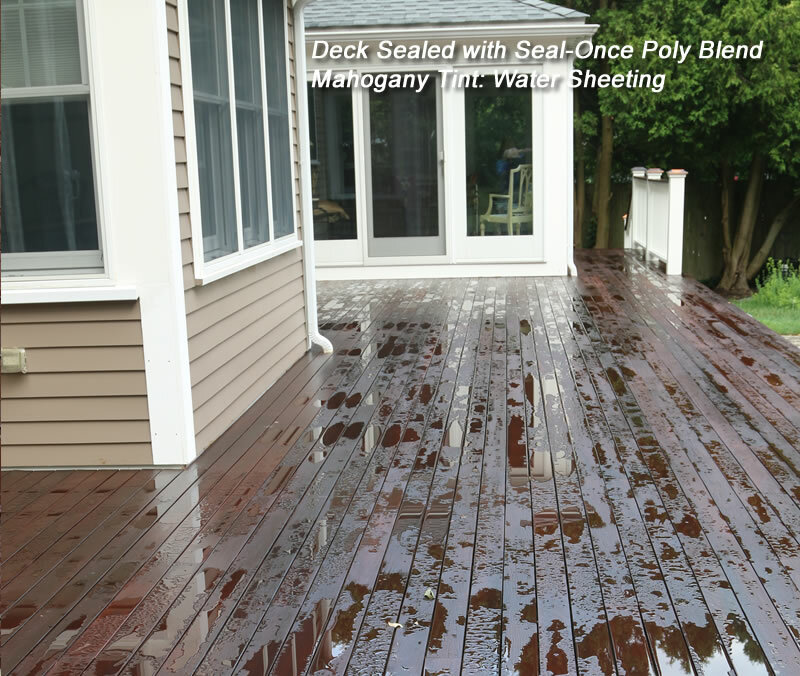 Please see the Seal-Once™ Poly Blend Waterproofing Wood Sealer Maintenance section for more details. Back prime all siding with 1 coat of Seal-Once™ Poly Blend Waterproofing Wood Sealer if possible to protect against checking. Coat all end grains with Seal Ends Once™ prior to applying tinted Seal-Once™ Poly Blend Waterproofing Wood Sealer for best results. Check for wood that looks dried out; shows color changes or fading of Seal-Once™ Poly Blend Waterproofing Wood Sealer. Warning: Do not use All Wood Cleaner for maintenance cleaning of Seal-Once™ Poly Blend Waterproofing Wood Sealer. Seal-Once™ Poly Blend Waterproofing Wood Sealer, is a water-based stain which can be shipped everywhere in the United States via FedEx. Seal-Once™ is shipped as a clear base product in one and five gallon plastic pails. LogFinish.com ships most orders the same day which are placed by 1:00 EST. Be the first to review “Seal-Once™ Poly Blend Waterproofing Wood Sealer” Click here to cancel reply. Lead Out Lead Paint Remover will remove multiple layers of lead, latex, and oil paint making lead non hazardous and EPA compliant, no Hazmat suit needed.